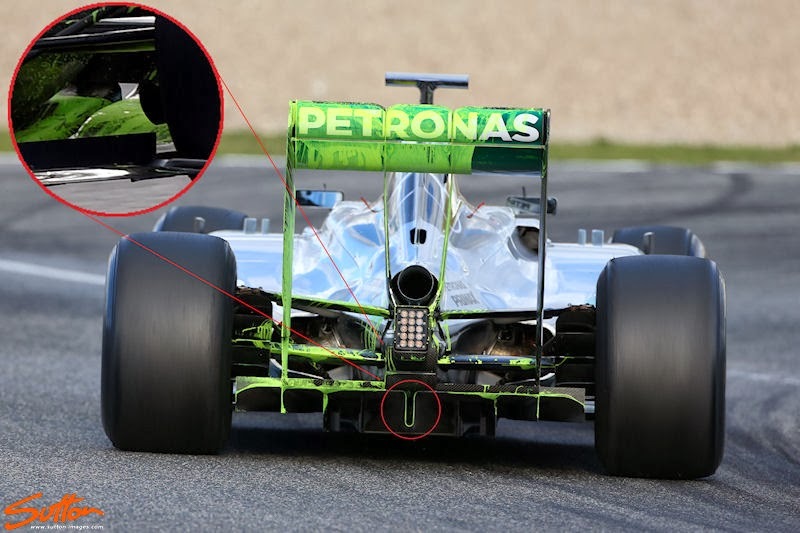 The W05 features a U shape in the centre of the Diffuser which allows both access to the engines manual starter and allows airflow from the upper section of floor to converge with the Diffuser. Whilst all the other teams have flush mounted a cover over the usual hole left in the Diffusers surface, Mercedes have looked to gain an advantage in the area. As the image in the inset shows, the floor has a concave section ahead of the U bend in order to both capture airflow and allow passage of the starter from the rear. This is by no means intrinsic to the cars design and can be copied relatively easy by the rest of the field (if it's found to give significant gains) but does take advantage of the additional area under the crash structure this season. With the engines crankshaft height having been raised from 58mm to 90mm above the reference plane with the new engine regulations both the gearbox and crash structure have been adjusted to suit, clearing some floor space above the Diffuser. Currently there is no bodywork surrounding this area in order to push airflow directly at the U bend but it could be an area we see the team develop once they have established their cooling options are sufficient.